The Behlen Country Heavy Duty 3-Point Hitch Mover has a multitude of uses, from moving Gooseneck trailers, ball hitch wagons on the farm to moving boats on the lake. The Hitch Mover covers it all. 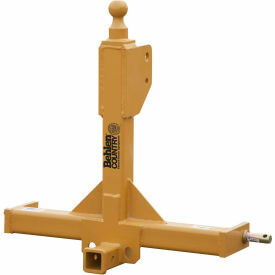 Comes with a 2-5/16" welded top ball, slide in section for any 2" receiver, and Category 1 and 2 lift pins. Rated for over 10,000 lbs. The Limited Warranty is restricted to farming applications only. Your review: We ordered this hitch to attach my husband's dump trailer to his new Massey Ferguson tractor. We were very pleased with the heavy-duty construction and it fit perfectly on our category 2 tractor. Your review: This hitch is very heavily built. Good value for the money. Not worried about this unit failing..... Would buy again!